Our gentle, caring approach will make your child feel right at home. A positive, pleasing dental experience will help your child build confidence and knowledge, setting a great precedent for their future dental health. Your child will always be grateful for the gift of a beautiful, healthy smile. Ideally, the first visit would be as soon as teeth begin to erupt. We understand this may not be a realistic expectation for many. Therefore we offer what is called a "Happy Visit". This visit is to let your child test out the waters in the dental office. They are allowed to sit in the chair and the assistant will show them all of the bells and whistles. Our motivation for this visit is to make it a relaxed and exciting place to be. Dr. Mitchell's philosophy is to let the child go at their own pace. She does not believe in forcing treatment. 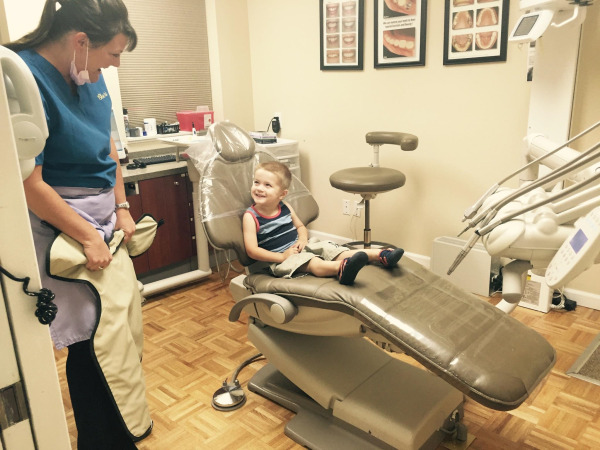 If she needs to do one filling at a time to make your child comfortable, we are more than happy to do so. This has proven to be very successful in treating these very important patients and minimized the amount of referrals to specialized care. For those children that may have high anxiety issues, we do have many resources for referral. If you are interested in getting your child started with a Pediatric Dentist, let us know and we can provide you with names and phone numbers of providers.